Well-appointed, furnished unit in excellent location and building. 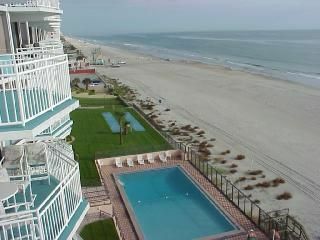 One block south of the Dunlawton bridge in Daytona Beach Shores (close to Ponce Inlet). Great views of the intercostal waterway also. Large (1990 square feet), direct oceanfront, sixth-floor unit with large balcony from the living room and the luxurious master suite. Remodeled bathrooms with new fixtures, ceramic tile and granite countertops. Kitchen also remodeled to include new cabinets, granite countertops. and stainless steel appliances-refrigerator, microwave, stove, dishwasher. Fantastic ocean and river views from this end unit. Building has an exercise facility with a sauna. Secured building. Large formal dining area and large breakfast bar. TV in every bedroom with cable. Leather furniture, stereo, bed linens, towels etc. This unit has it all. Air Conditioning, Cable TV, Stereo, Full Kitchen, Microwave, Dishwasher, Refrigerator, Cooking Utensils provided, Linens provided, Private Washer & Dryer. Exercise room Sauna, Pool (shared) CALL FOR LAST MINUTE RENTAL SPECIALS.